Leather and cashmere sound so luxurious and that's exactly how I felt when I put on these J.Crew cashmere-lined leather gloves. I have a thing for jackets but I don't have much interest in winter accessories. I've been wearing cheap gloves for years. 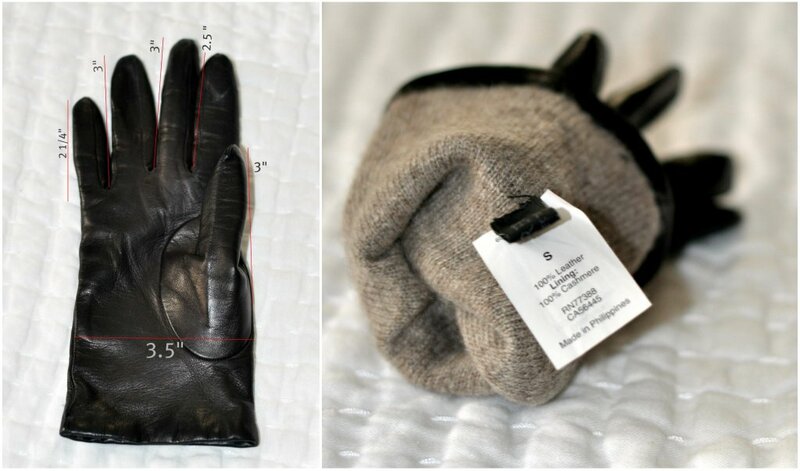 While wandering around my local J.Crew last month, this pair of leather gloves caught my eyes. As soon as I put them on, I know I had to get them. I know ladies with small hands have had a hard time finding gloves that fit. A size small fits me surprisingly well. I included some measurements just in case you're interested. These gloves are made with cashmere lining for ultimate comfort on cold and windy days. The leather is buttery soft. They're available in 4 gorgeous colors and currently on sale. If you're looking for a petite-friendly pair of leather glove, I highly recommend these. Thanks for the measurements- very helpful. People would be surprised that I do actually need gloves where I live. My fingers are like icicles! Those look fantastic! I would love a pair like that since I live in the Chicago area. Thanks for the thorough review. I know what you mean Sydney! For YEARS I bought nothing but cheap leather gloves because I'd always lose them but finally bought the bullet and bought a pair of Portalano and now...I can't go back :) These look so chic on you! Thank for the review and measurement. Have a good weekend! Love cashmere. Feels so good on the skin. You look lovely as always. Small gloves are really hard to find! I've had the most luck with vintage gloves handed down from my grandma, but most of them aren't lined which means they're not as warm. I'm definitely going to have to check those JCrew ones out. That looks good! Ive been wearing woolen gloves for ages coz I could not find the leather in my size! Thanks! These look really nice though - the cashmere must be very soft and keeps your hands warm. I've never really bothered to buy expensive gloves, but these look like you'll get a lot of uses out of them! Yay for seeing these gloves in action! I bought similar gloves a couple of years ago for my Grandmother and Great Aunt for Christmas. I found mine on Bluefly for less than $50 per pair and they've held up really well. The leather just gets softer as the years go by. considering ordering womens for a tight fit. you tell me where I get these? Thanks.